So Ellery is teething, and it has been BAD. My mei tai has been on for hours, which is making me more and more thankful for it. The more I think about it, the more I want to sing about it, so here's a post, devoted to my mei tai, the most important parenting tool I've stumbled upon. For those who don't know, my love affair with my mei tai started with my daughter. My son was very independent from the start, so imagine my surprise when baby girl popped out wailing every time she was set down. A shoulder sling sufficed for the first few months, but the older and heavier she got, the harder it became to tote her around. 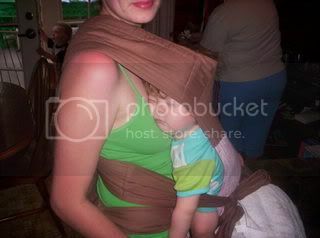 A mother in a breastfeeding group I went to showed me the basics, and I made my first one. It was glorious. The clouds parted, angels sang. I could wear her for hours without feeling the effects in my back and shoulders. And Ely? She could nurse, play, and sleep without fussing, safe beside mama. Mei tais have been used for hundreds of years in Asian cultures, and recent studies have shown the benefits of "wearing" your baby. Worn babies have been shown to be happier overall and learn more quickly. I've seen many beautifully designed mei tais. 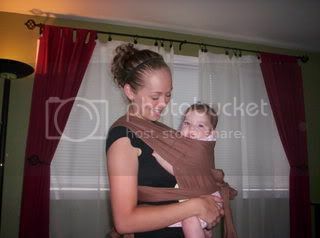 My personal goals when I designed mine were comfortable straps that didn't cut into the shoulders and waist like so many carriers do, ease of use for myself and others, and of course, my baby's comfort. The Baby Bean carrier, which is currently being redesigned, will have all of these features. The straps are wide and padded three times over, with Warm and Natural products. This prevents uncomfortable bunching at your sides and shoulders. 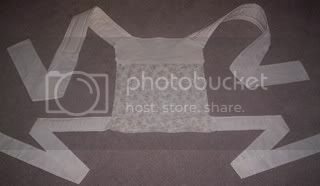 The body is reversible, with a fun, patterned fabric on one side, and a solid on the other. Each seam is reinforced twice for safety. New add on features include a flip up head rest and a detachable nursing cover. I use my mei tai every day with Ely. Shopping used to be a nightmare, as anyone with two kids can attest to. Now, it's so simple. Best of all, it also fits my husband, so he can share special time with his baby girl. Cooking, camping, shopping, hiking...my mei tai has seen it all and proved it's worth over and over. I love my Mei Tai! Ely girl enjoying a nap. Little Evelyn takes it for a spin. A new mei tai, ready to be shipped. A day in the park, loving her mei tai. Showing a friend the ins and outs of tying.